I have been facing a lot of health issues lately hence MIA here!! I have a lot of stuff to share here with you pending so hopefully I will be active more often here. So today I have swatches of 11 Glitter Gal polishes to share with you which I got from Maconii's online store. They ship Worldwide, so you can get these from them easily. Among 11 polishes, 7 are Duochromes, 3 are Holographics and 1 is Opal Effect Polish. So let's not waste any more time and jump right at the swatches. Let's start with Duochromes first!! Buckled Bronze - A duo chrome shifting from rose red to orange gold. Shown here are 1 coat over 2 coats of Glitter Gal Serpent Black plus Top coat. Hell - Bent Blue - A duo chrome shifting from teal blue to cobalt blue. Shown here are 1 coat over 2 coats of Glitter Gal Serpent Black plus Top coat. Beetle Wings - A duo chrome shifting from aqua blue to cobalt blue. Shown here are 1 coat over 2 coats of Glitter Gal Serpent Black plus Top coat. Twisted Jealousy - A duo chrome shifting from grass green to brown red. Shown here are 1 coat over 2 coats of Glitter Gal Serpent Black plus Top coat. Contorted Mauve - A duo chrome shifting from purple to forest green. Shown here are 1 coat over 2 coats of Glitter Gal Serpent Black plus Top coat. Midnight Lake - A duo chrome shifting from blue to magenta pink and it has flakies present in it. Shown here are 1 coat over 2 coats of Glitter Gal Serpent Black plus Top coat. Blue Suede Shoes - a light blue linear holographic polish. Shown here are 2 coats plus Top coat. Lizard Belly - a dark green linear holographic polish. Shown here are 2 coats plus Top coat. Belgian Chocolate - a brown linear holographic polish. Shown here are 2 coats plus Top coat. And Lastly the Opal Effect Polish!! Coober Pedi Green - A duo chrome flakie topper. Shown here is one coat over 2 thin coats of G Gal Serpent Black. Duochromes - These are very sheer in consistency so have to be used as a topper over Dark colors for the needed look. Other than that great color varieties and formula was nice as well. 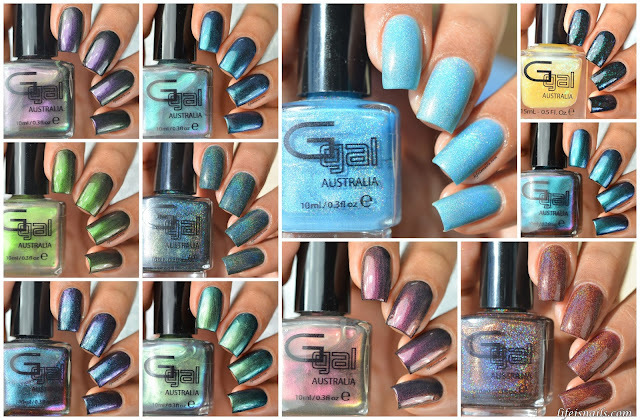 Holographic - Stunning Polishes, Have an amazing intense Holographic look in them, Nice and pretty colors. Loved them!! Opal Effect - Gorgeous polish with marvelous formula, the flakies lay down really well and flat, so overall amazing.